Hello and welcome to the July edition of MFT's New Product Tour! The wait is over and all of the new products we've been showcasing this week are now available in the MFT Boutique! Tonight, I'm giving you another look at Party Balloons, which is sold EXCLUSIVELY at mftstamps.com. I have a TON of pictures to show you, so please, grab a slice of birthday cake and some milk and relax. For my first card I started by cutting a background sheet in Berrylicious Card Stock and cut out the CELEBRATE from a LLD Accent It - Celebrate Die-namics die. 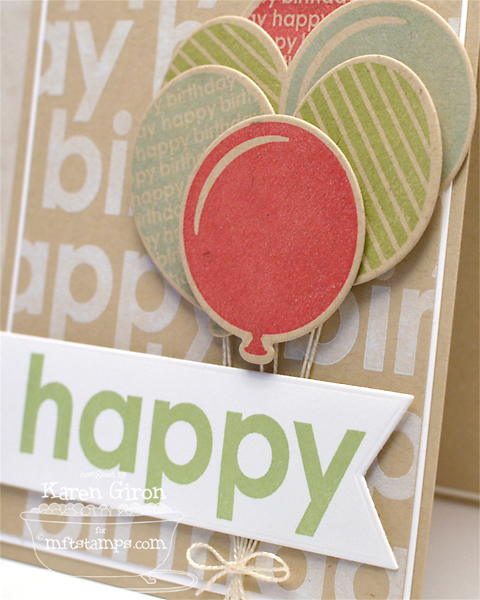 I cut out 3 Party Balloons Die-namics and then stamped them in Gumdrop Green, Electric Red, and Banana Split Ink. 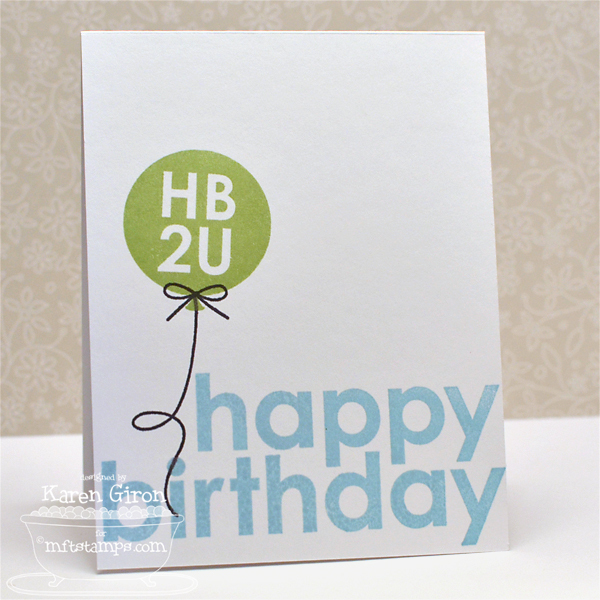 On the inside of the card, I stamped a string and bow in Black Licorice Ink and added the HB2U balloon in Gumdrop Green. I used Berylicious Ink for the happy birthday - love those big letters! Alrighty! 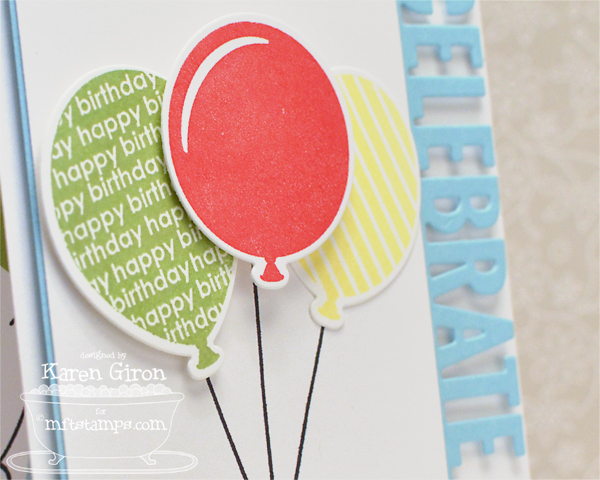 My next card has a little background stamping using some of the little elements found in the Party Balloons set. 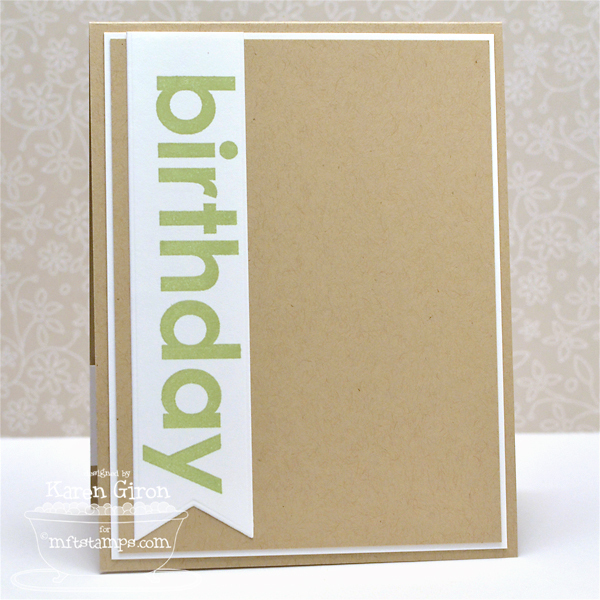 I adore stamping on Kraft Card Stock - it's so rich and yummy! The layout for this card is The Sweet Stop's SSS218. I made another trio of balloons, but this time I stamped 2 of them directly on Smooth White Card Stock and then used a Party Balloons Die-namics to pop up the front balloon. I added some string and bows in Kraft Ink and I stamped the bow on the Berrylicious balloon twice - once underneath and one on top of the die cut. Now it gives the illusion that it's connected. I layered some stamps and card stock inside the card - first I stamped the LLD Jumbo Mod Borders in Tangy Orange Ink and then added the Berrylicious "happy" over the top. 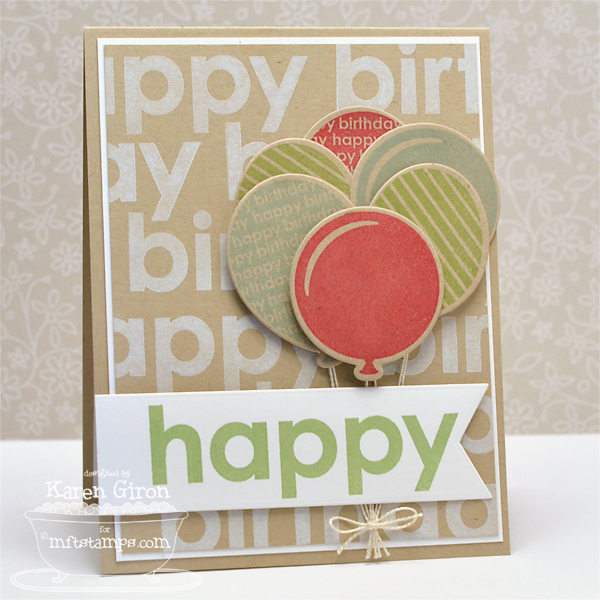 I cut out a Happy Birthday Die-namics in Kraft Card Stock and glued it right over the top of the arrows. And finally, I have another card with some background stamping, this time in white pigment ink. 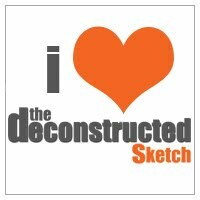 Kraft + white ink = delish. 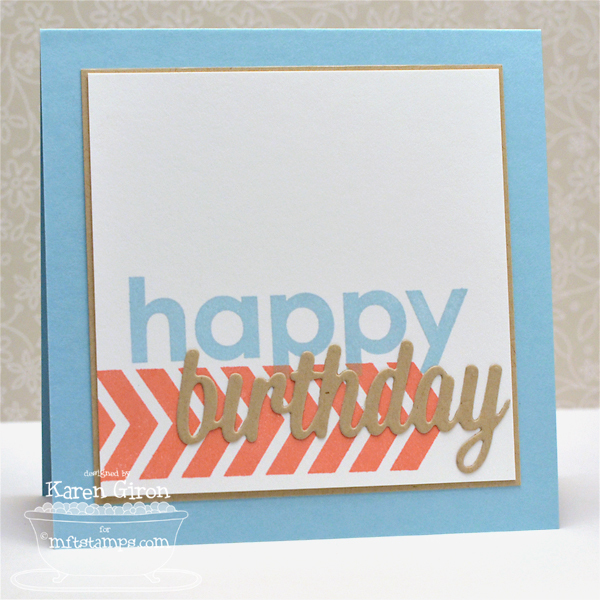 I'm using Clean & Simple Stamping's FTL248 for this card. I cut out 2 of each balloon in Kraft Card Stock and then stamped them so I could layer up a big bunch of balloons. I used some ecru perle thread for the balloon strings and tied a little bow at the bottom. I stamped the "happy" in Gumdrop Green Ink on a Fishtail Flags Layers STAX Die-namics and then popped it up with foam tape. I repeated the fishtail inside the card and kept it pretty sweet and simple. 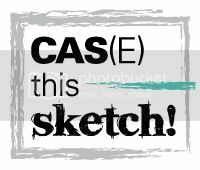 Be sure to stop by the MFT Blog for all the amazing details about this release and you can find a complete list of all designers playing along in tonight's New Product Tour. Love all the birthday cards. The one on kraft has such an interesting look. Thanks for sharing. 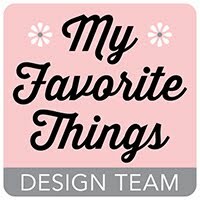 Love your cards! Great color combo on the first two and the one on kraft is genius! Great cards! I really like the kraft one!!! Love. Them. All. Seriously cute cards, Karen! Karen, all these birthday cards are fab - I especially appreciate the one based on the Sweet Stop Sketch for this week - you have made a great card by stamping those happy images from the MFT stamp sets! 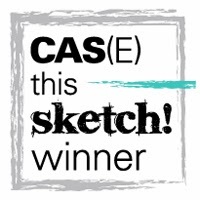 Thanks for playing along with us this week! WOW, Karen...so many wonderful cards from the same set! 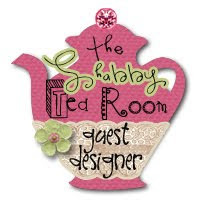 Love the color palette and all the lovely designs. 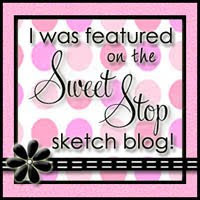 Thanks so much for joining us at The Sweet Stop this week! Great set of happy cards! Love the colors, & the balloons look so big- on my list! 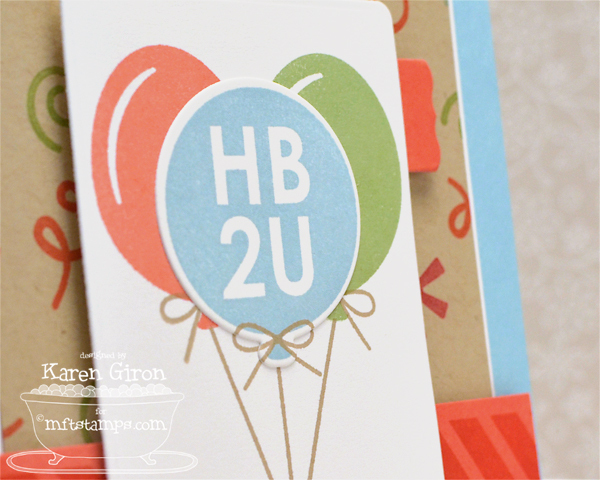 loooove these two, Karen, but gosh....is that kraft balloon card just the cutest! great job. These are fabulous, Karen! 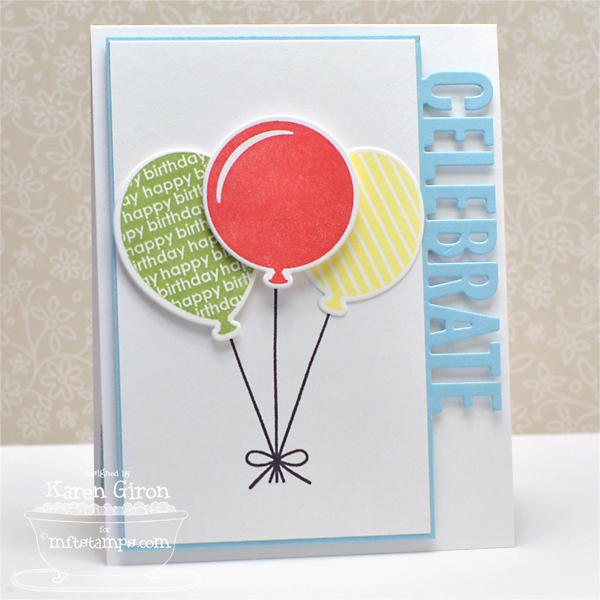 Love the vertical fishtail with the sentiment and the Kraft balloons! What a fun collection of cards Karen! Love all the different colored balloons! Sweet birthday cards Karen. Love the fun colors and those balloons (but I specially love the first one with the die-cut greeting.) Thank you for playing along with us at The Sweet Stop. 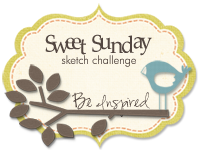 Dream BIG - MOJO Monday's 300th!